There were three photos of flowers in the Unassigned Bin. For the next three Fridays, I will provide the flowers. Mary MacADNski: Thanks, Ray. Just the right time of year for some colour for us. That is why you bougainvillea is such a hit with me. Flowers are always welcome! Both of these are lovely shots! I enjoyed this version of this song. Mary MacADNski: Thanks you. QQQ is one of my favorite songs. I like this version but their are some awesome ones out there. Mary MacADNski: Just what we need during this icy day. How gorgeous, Mary! Bring them on. Mary MacADNski: You will be seeing more from here. Mary MacADNski: The mixed asters is from my magic garden. I will some day do a series on it. Mary MacADNski: I love cutting flowers. I adore the indoors. Mary MacADNski: You can't beat asters for autumn colour. I am all in favour of that. We have one daffodil about to flower! Mary MacADNski: Wow! We are having freezing rain; no daffodils. The colours are superb. Love the music. Mary MacADNski: You can't beat asters for autumn colour. QQQ is one of my favorite songs. I like this version but their are some awesome ones out there. This lady had no passion for the song. Both are very good photo's. Thanks for sharing your flowers. Mary MacADNski: We need to see colour in winter. Right now I have had roses that have lasted weeks and it is winter tulip season here. With awful wet day we've got today your flowers strike a cheerful note to brighten the day up Mary. Mary MacADNski: We have freexing rain today with everything closed and cancelled. Yes, I would rather look at fleurs. a lovely reminder of summerdays - and a fine bunch of flowers on a winterday - they are encouraging! Mary MacADNski: Our long winters make us need to see bright colours. The winter tulips are so welcome. ..and very pretty they are, too. 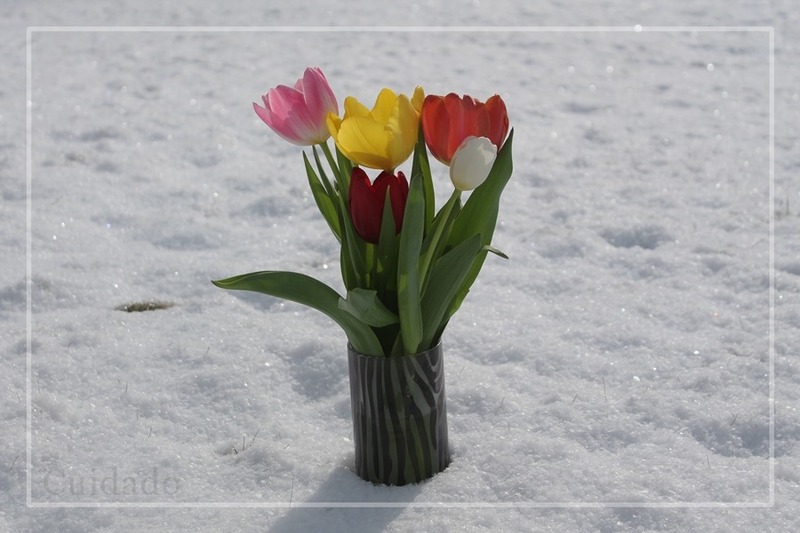 I like the tulip arrangement in the snow. Mary MacADNski: They grew out of their vase. Did you know tulips are the only plant that continues to grow after it is harvested? I usually have to change vases during a bouquet's lifetime.